The Sound Settings dialog box lets you set the compression settings for the movie you will export. For tasks related to this dialog box, see Exporting QuickTime Movies. From the top menu, select File > Export > Movie. In the Export to QuickTime Movie dialog box that opens, click Movie Options. In the Movie Setting dialog box that opens, click Settings in the Sound section. Lets you select a compression type. The default setting is None. This exports your audio as is without performing any lossy compression or conversion, preserving its fidelity. Other compressors can be used if you need your movie's audio track to be exported in a specific format, or if disk space or download speed is critical, but they may impact the quality of your movie's soundtrack negatively. Lets you select the audio rate at which to export. It is best to export your audio at a rate that matches the rate of your original sound files. For example, if your file has an audio sample rate of 48 kHz and you choose a conversion rate of 22.05 kHz, the sound will play at the same speed, but higher frequencies will be missing, making it sound muffled. For reference, the standard sound quality is 44.1 kHz for films, and 48 kHz for DVD. Lower rates are liable to impact the quality of your movie's soundtrack negatively, but they can be useful if disk space or download speed is critical. Lets you select the encoding size. Also known as Bit Depth, this determines the amount of precision used to record each wavelength in the soundtrack. The standard size is 16-bit. If you choose 8-bit, the amount of disk space your sound track requires is halved, but the audio will sound muffled. 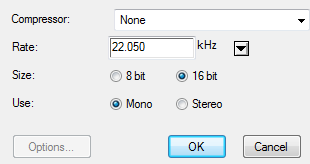 Lets you decide whether to use the Mono or Stereo channel mode. Stereo sound has a separate sound track for the left and the right speakers, allowing to make the origin of each sound realistically match the origin of their corresponding action. If you choose Mono, your sound track may use less disk space, but both the left and right channels will be merged into a single track.